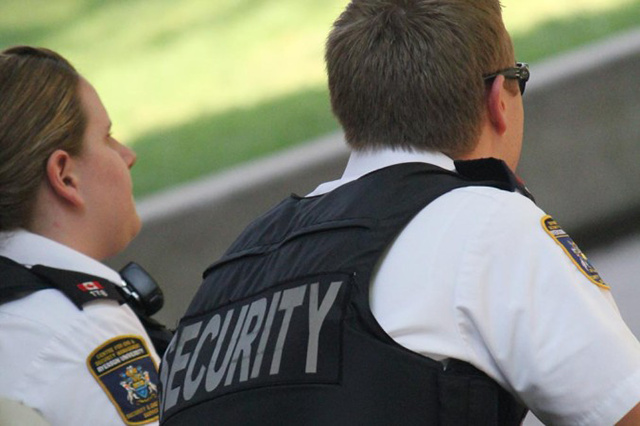 At Protect-US Security Services we are the provider of uniformed security guards on short and long term contracts to various businesses and organizations both commercial and domestic. We are together committed towards making you and your property safe and secure with our professionalism and value added services. Our staff will make the process of obtaining security guard services as seamless as possible. You will have a dedicated point of contact providing the consultation to find out exactly what the security needs of yourself or your business is. He or she can then provide you with a customized security services plan tailored specifically for you including a price quote, usually within an hour of your initial request. Our organization prides itself on providing the most comprehensive and complete security guard service in the industry. We can do this because our management and security guards are among the most experienced. Each security guard is given an extensive background check. He or she then is rigorously screened to verify security suitability. Numerous tests must be passed. And each security guard undergoes follow-up training. All managers come from the security industry and also undergo thorough training. Protect-US Security is proud for its distinct culture and strong value. These values (listed below) guide how we conduct our business and develop positive relationships clients and employees. Reach new height of quality and accountability in security industry. We believe in challenging the status quo. The way we challenge the status quo is by thinking differently and making our service specific, top quality, affordable & consistent. We will continuously think and perform differently through planning, training, documentation, supervision, feedback, and technology. Technology integrated security solutions that help us gain and retain the competitive edge. with benefits and future performance based raise program ensures quality guard and leads to high guards retention rate. ensures the guards can reach a manager/supervisor at any moment for assistance. Our shift supervisors have abundance of hands - on security experience. Our shift supervisor not only randomly checks sites but try to spend 1-2hr with each security officer on site and watch them in-action. This method has been very successful to enhance field performance & opened new channels for communication. without notifying clients immediately and then update them following work day unless it requires their immediate attention. Our site managers work very closely with the clients to provide & receive continuous feedback. Protect-US recognizes its ethical responsibilities towards our customers, employees, competitors, suppliers, and local communities. At the heart of our strategy is the safety and security of our customers, their assets and the general public, so through our everyday business we are constantly contributing to a safer society. Protect-US is committed to providing a workplace that is safe, fair and rewarding for our employees. We encourage an open door policy between employees and our management team with excellent communication being the key. Protecting the health and safety of our employees, our customers, and the natural environment is a core value within ISS Security Services Limited. We will not be satisfied until our workplaces are safe from hazards, our employees are injury free, our services and products are safe.